The consensus that autism is from an intrauterine infection is growing, bolstered by Patterson’s and Fatemi’s studies. However, the question still unanswered remains: which infection? This of course is unknown. But in Autism: an Ancient Foe, a prime, conceivable candidate is logically presented, and compellingly supported by scientific literature, old and new. Until 1980 autism is called “childhood schizophrenia” and in some parts of the world, it still is. By the same token, an extensive body of medical literature ties schizophrenia to mycobacterial disease, the infectious focus of this book. This was only brought more sharply into focus when Rzhetsky, in 2007, used a proof-of-concept bio-statistical analysis of 1.5 million patient records, to find significant genetic overlap in humans with autism, schizophrenia………and tuberculosis. To this effect NIMH trials, presently ongoing, will determine whether the anti-tubercular drug Seromycin helps to diminish the symptomatology of autism as it did in animal models. In a sense, this connection is hardly a new one. As early as 1887, John Langdon Down, a subset of whose “developmental disabled” children were autistic, saw this condition “for the most part” as resulting from parental tuberculosis. Ann Arbor pathologist A.S. Warthin, appearing in The Journal of Infectious Diseases, suggested that even a woman with silent foci of tuberculosis in her body, and with no symptoms could experience reactivation of her disease upon becoming pregnant. That, in turn, could transmit blood-borne TB bacilli to her unborn child. In fact, Warthin empasized this sort of transmission was not only possible, but common. Warthin saw silent assymptomatic tuberculosis during pregnancy as a “very grave danger” to the fetus and – as J.F. Schoeman would later argue – it could cause the sort of neonatal brain lesions that lay behind all neurodevelopmental disorders, including autism. But TB has been “eradicated,” right? Hardly, Broxmeyer explains. While tuberculosis is not generally regarded in the West as the killer disease it once was, according to the World Health Organization, TB presently affects over one-third of the world’s inhabitants. Even in the twenty-first century, globally, at least one person is infected with tuberculosis per second, and someone dies of TB every ten seconds. Tuberculosis kills 2-3 million people each year, more than any other infectious disease in the world. Eight years in the making, An Ancient Foe is a short and fascinating read that is equal parts science, history and whodunit. Broxmeyer’s meticulously-documented biography of the disease weaves back and forth in time and place. Readers leap from the modern day back to the 1800s, forward to the 1930s, and then back again as Broxmeyer spins his tale and makes his case. 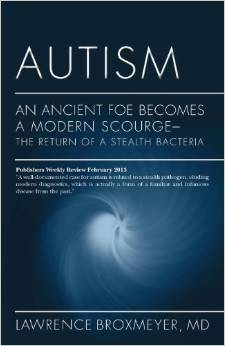 Along the way, he explores the little-known historic connection between autism, schizophrenia, and tuberculosis, and explains in layman’s terms the complex series of steps, missteps, and steps-left-untaken that have allowed autism’s “stealth pathogen” to evade modern diagnostics for decades. Lawrence Broxmeyer, MD is currently a Pennsylvania internist and a medical researcher. Dr. Broxmeyer’s research covers the most challenging medical problems of our times, including AIDS, Alzheimer’s and now autism. Broxmeyer served on staff at New York-affiliate hospitals – SUNY Downstate, Cornell and New York University for nearly fifteen years. In the role of lead author and originator, he worked with colleagues in San Francisco and at the University of Nebraska to pioneer a novel technique for killing AIDS mycobacteria and tuberculosis – with outstanding results [ see The Journal of Infectious Disease, 2002 Oct 15]. Recently, he contributed a chapter regarding these findings to Sleator and Hill’s textbook, Patho-Biotechnology, published by Landes Bioscience. His peer-reviewed articles are available on PubMed of the US Library of Medicine – National Institutes of Health at: http://www.ncbi.nim.nih.gov/pubmed?term=broxmeyer%20L. I have great respect for Dr. Broxmeyer’s extensive research and clinical experience in treating and researching the causative association and interaction of the tubercular mycobacteria with many chronic diseases including Autism and Cancer. No physician or researcher has undertaken a more thorough in-depth study of the relationship of the TB mycobacteria to these chronic diseases than Dr. Broxmeyer. 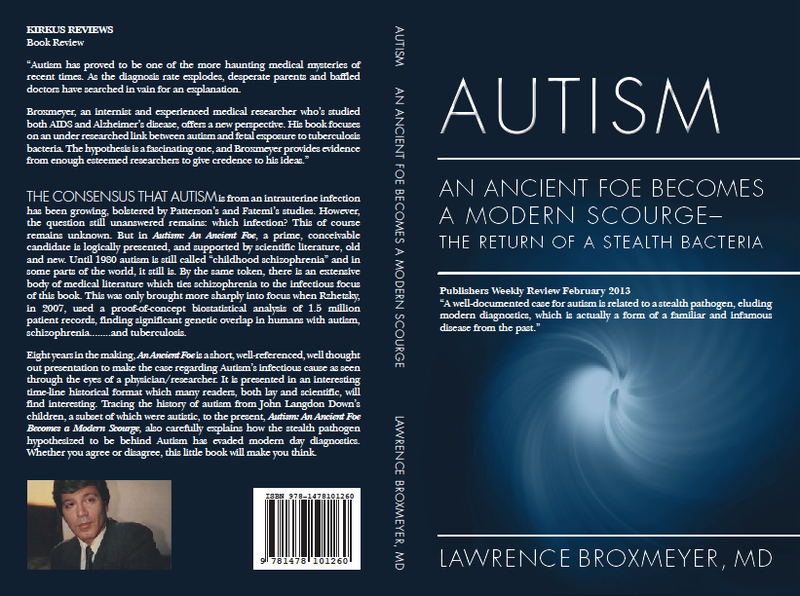 His recent book on AUTISM is a must reference book for both the professional and lay reader. Dr. Broxmeyer’s book is extremely well referenced and extensively documented. This is a really interesting, well-written, and compelling book. I highly suggest anyone interested in Autism to read this book.